The measurements should be taken with the tape measure on the leg, naturally not tightly. Take all measurements and outline with normal socks and polo pants on. Measurements can be in inches or centimeters. You will need to measure both legs, both left and right. 1. 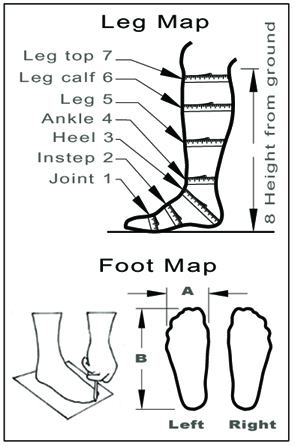 Using the Leg Map drawing as a guide, next list the areas starting with 1. Joint, and end with 8. Height from ground to Leg Top. 3. Transfer measurements from your notes to the options for the boot options on the web page.